Sweaty palms, weakened knees, and ecstatic but anxious hearts. Nothing beats the massive swirl of emotions that you get as you and your partner bind your lives as a married couple. After the tear-jerking and overwhelmingly joyous ceremony for the new union, a feast and celebration are needed to follow. 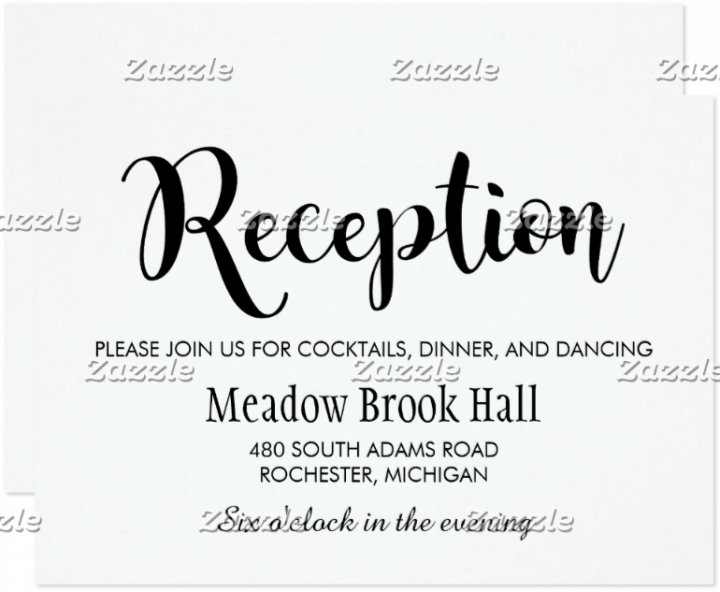 A wedding reception normally follows after the wedding ceremony and to elaborately inform the guests about it, a wedding reception card is needed. The designs for the wedding reception card can range from stylish to vintage to minimalistic ones. 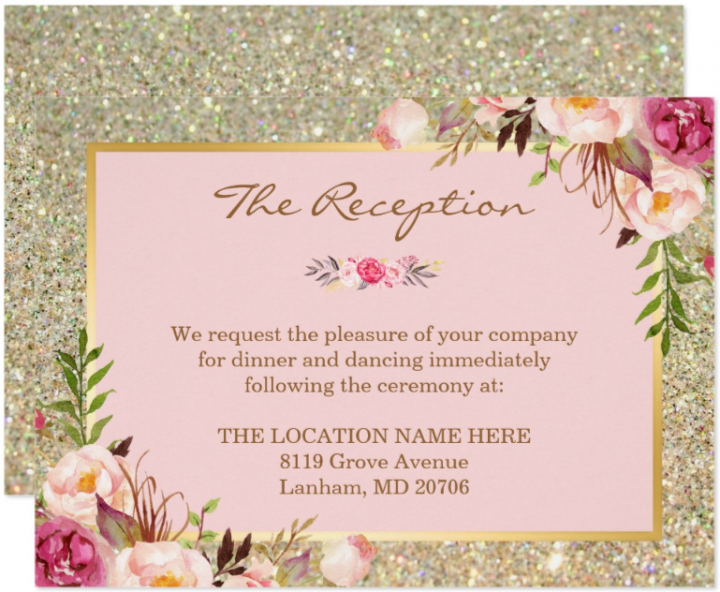 If you are still unsure as to what design you will implement on the card, you might as well choose from the list of the beautiful wedding reception card designs and templates that we will show you in this article. We will not keep you waiting any further and let the parade of stunning and outstanding wedding reception card designs begin! It has been a part of a tradition for weddings in any part of the globe to have a reception after the wedding. 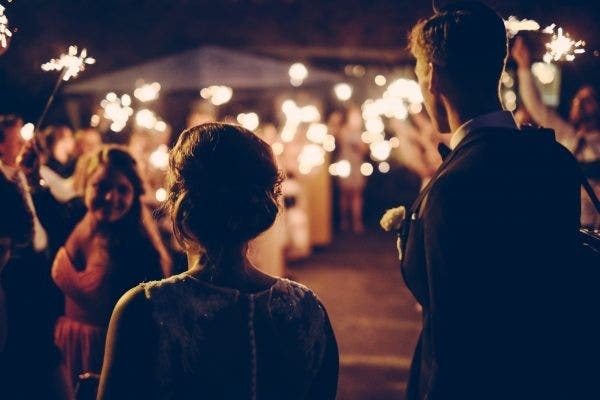 This creates an opportunity to celebrate for the new union and to establish a connection with the rest of the guests and wish the couple for a path of a happy married life. You can go all out at the reception party and enjoy it to the fullest before you start another day living the life of a married couple. 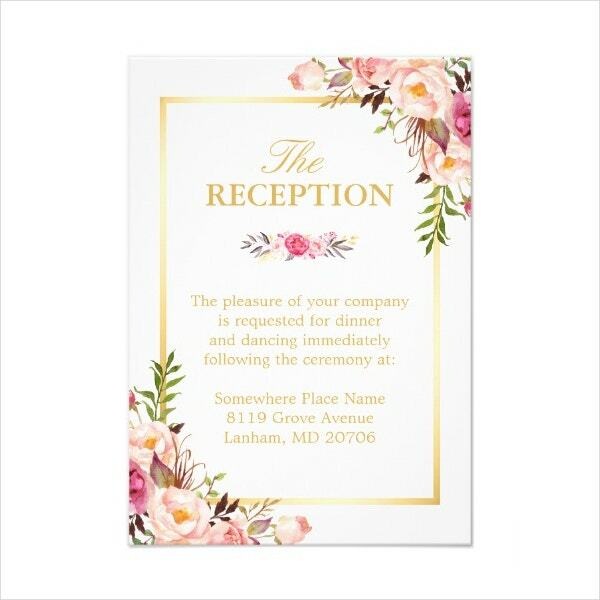 How to Pick a Wedding Reception Card Template? Choosing a wedding reception card template is quite vexing especially if we still have zero ideas as to how you want it to look like. But when we do, the creative side of our brain does not cooperate enough and leave us with nothing but patches of ideas that are either incoherent or unrealistic. In this situation, it would be best to turn to pre-made templates where everything is already laid out and all you need to do is click the download button to be able to use it. But, before you purchase a template, it’s important to have criteria to base your choices on and make an informed decision. Most weddings don’t have themes, thus the receptions don’t have one, too. But, for those who want their weddings to be a spectacular show of a certain theme, then you should base the design of your wedding reception card from it. How do you want your wedding to be? Are you going to hold it at the beach? What about having a vintage theme? Or are you going for a simple one? The list could go on as long as you want, but the final decision will be up to what you and your partner may arrive at. In choosing a theme, make sure that it is achievable and realistic. Otherwise, it would take up too much time to create. This will also allow for a more relatable concept that the guests would highly appreciate. It could create a spark for discussion among the guests, giving them the opportunity to interact with each other. You may also see invitation card templates. How can you operate without a budget? In a wedding, the list of expenses could go on as long as the longest hair that ever existed, and adding to it is the expense of the reception after the wedding. That’s why you need to carefully plan on how you spend your money. Using these pre-made wedding reception templates is a cost-effective method as they do not cost much compared to hiring a graphic designer to work for it. Before you buy anything else on this list, make sure that you already have the final cut for your budget. So when you skim through the list, you can easily target those that are within the budget. 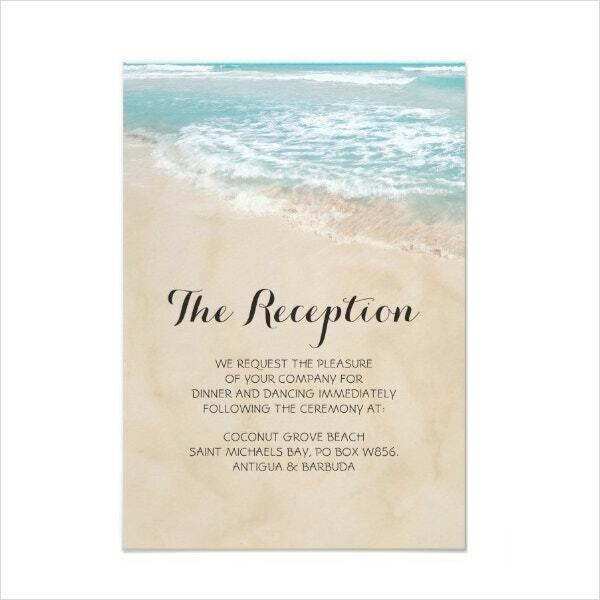 With regards to choosing a template for the reception, there are cheap but standard-quality ones from our list. They are curated to show the most affordable without compromising the quality of the design. If you want to cheaper deals, there are available bundles that cover up various templates such as the wedding invitation, place card, wedding reception card, and other graphics templates needed for the wedding all for the price lesser than when you purchase them individually. You will be busy for the next days or weeks because of all the preparations that you need to go through. That’s why you need to assess whether you will be able to make time for designing the wedding reception card template. It would be better if you can manage to clear up a little time for designing the template as your input is needed in it. But if the chances are slim, you can opt to delegate the task to someone you trust and believe that they will be able to do the job on par or better than you. You may also see wedding card designs. There are some weddings that are only weeks away, but most of them have enough time allowance and would likely be months away from the actual date. If you are on the latter, you definitely have more time than needed to edit and customize the wedding reception card template yourself. This allows for a more personal approach to the design that the guests will definitely love and appreciate. Anyway, editing the template won’t take that much time because everything is already laid out and arranged for you and all you need to do is put in the details and maybe change some colors and pictures if there are any. 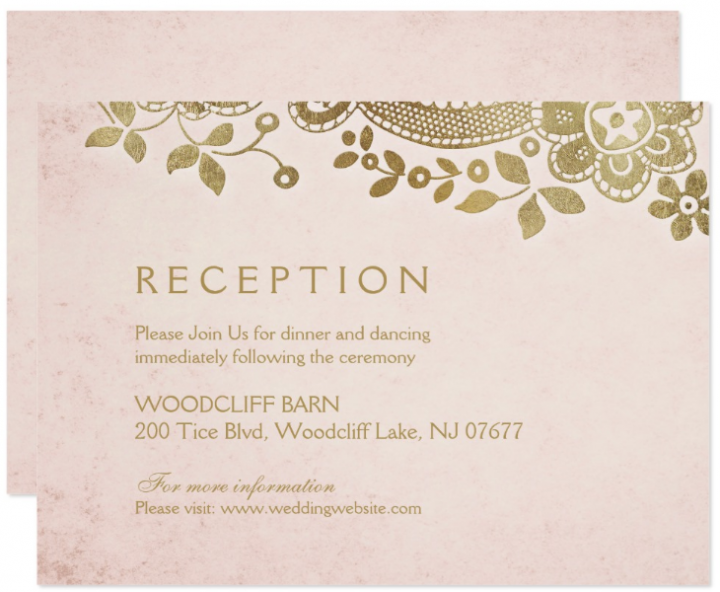 You may also see traditional wedding invitations. If you haven’t decided on a specific theme and would go with anything, you might as well base your decision on the impact and vibe of the design of the template. There are designs that manifest a stylish look that elicit a sophisticated vibe. You can also go for a simple design, like a minimalistic vibe that would go with anything. 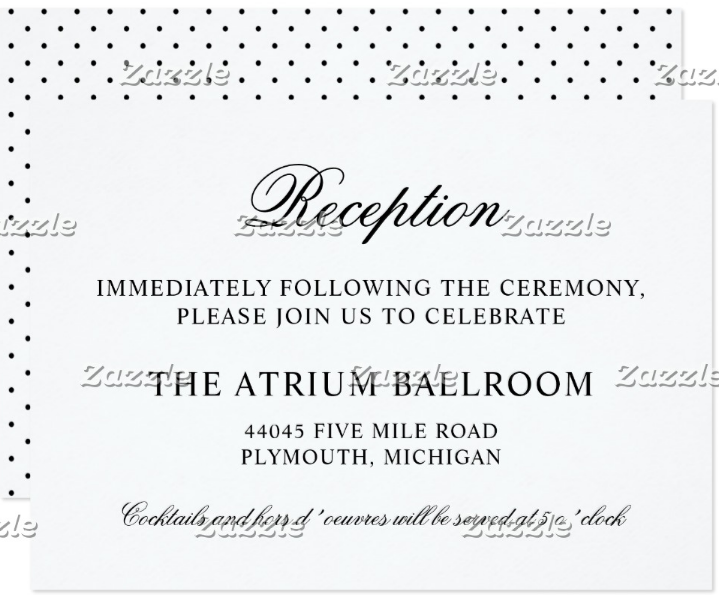 You may also like wedding party invitations. 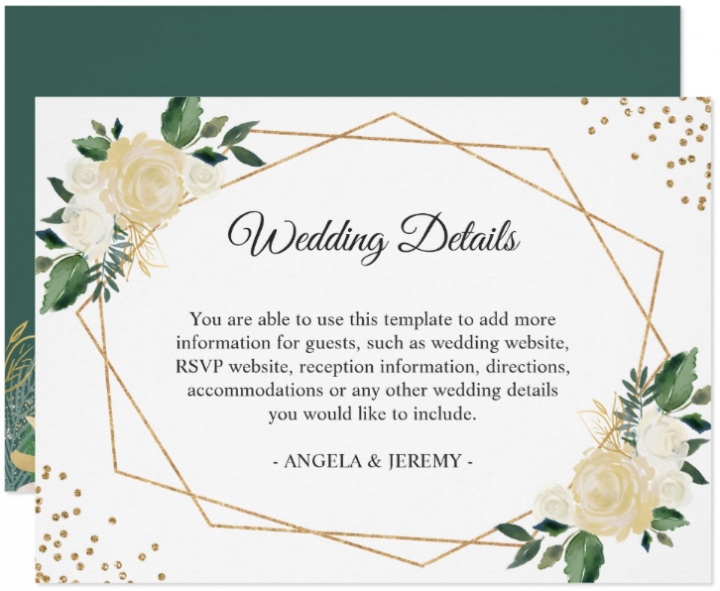 How to Customize the Wedding Reception Card Template? You will always have the option to hire a graphic designer to do the work for you. But, if you want to shave off some expenses and opt to edit the template yourself, then you have come to the right place. There are easy steps on how to customize any of the templates that we have shown in his list. Check the steps below. Photo editing software programs vary in capabilities and level of difficulty in usage. There are some that are easy to navigate and take control of, and there are also those that have numerous complicated tools that you can work with. Granted, the latter programs have more functionalities and tools that you can use to fully manipulate the output that you are aiming for the wedding reception card. But given your skill level, in which we assume is still in the beginner’s area, it would be better to choose what’s easier for you to familiarize with. You may also see wedding card templates. There are easy-to-use and user-friendly photo editing applications with lesser complicated tools that you can download or access online. They will still give you your desired output for the wedding reception card even though they are simpler versions. You may have enough time to figure out the complicated controls, but it will give you more time for other important matters if you opt for the simpler photo editing applications. Assuming that you have already chosen a template and download it, you can open the file using your chosen photo editing application. It is important to note that the applications should be compatible with the file format of the template of your choosing. Otherwise, you may have to download or look for another application that will be able to open it. But, to ease your worries, the templates that we have collected in this article are compatible with most of the photo editing applications. So calm yourself down and open that template. 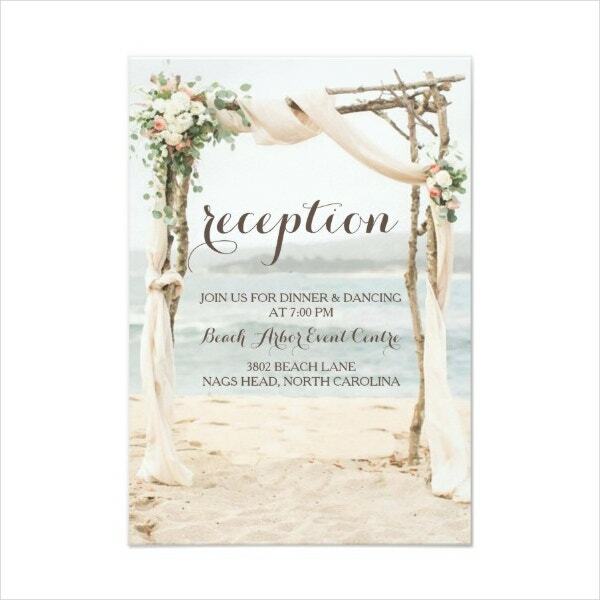 You may also like invitation card designs. If you have reached this step, then you have definitely chosen a photo editing application that can open your chosen template. Since you have already opened it, the next step would obviously be the editing part. Now, this could be stressful for some especially those who are still familiarizing with the User Interface (UI) of the program. Don’t rush into it and take your time going over the tools, functions, and features. Given that you opt for customizing the template yourself, you must still have plenty of time before the actual wedding. So, use every second of that time to learn, practice, and experiment. Change whatever element you want to change until you arrive at the result that you wanted. You have finally arrived at the most crucial part in editing the wedding reception card template. Obviously, you need to save it so you can use the file with the changes that you made. In saving the final output, you can opt to overwrite the original template. But, word of advice, it would be best to save it as a file separate from the original one. This will allow you to recycle the original design in case you will basing some of your designs from the original template. Also, it will be easier for you to track the changes you made in it. 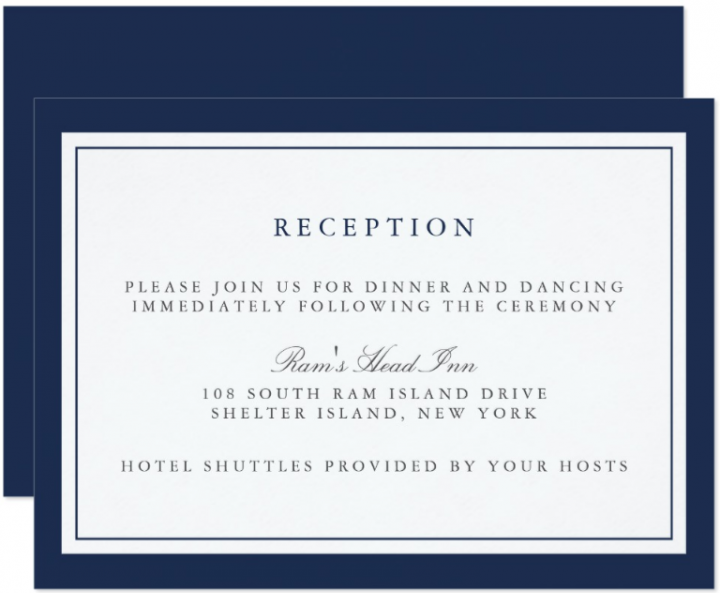 You may also like wedding invitation formats. This part may be on the last step, but it is important to note that you need to save your progress from time to time. This will help you start at a certain save point of your template and continue designing it. You’ll never know when a blackout happens or your computer suddenly shuts down. You will be assured knowing that you will not start from scratch after all the effort that you’ve put into designing it. You may also see wedding RSVP cards. The wedding reception might be less stressful than the actual sample wedding ceremony, but it still is as crucial. You have to remember that it is where you will lead your guests into after the ceremony, so they will be expecting that you will inform them of the necessary details for the reception by sending them a wedding reception card. We are sure that you have already decided on what design to use for the wedding reception card, and we are happy that we have helped you arrive at such a decision. We wish you all the best in your married life and may you both live happy in your lifetime! 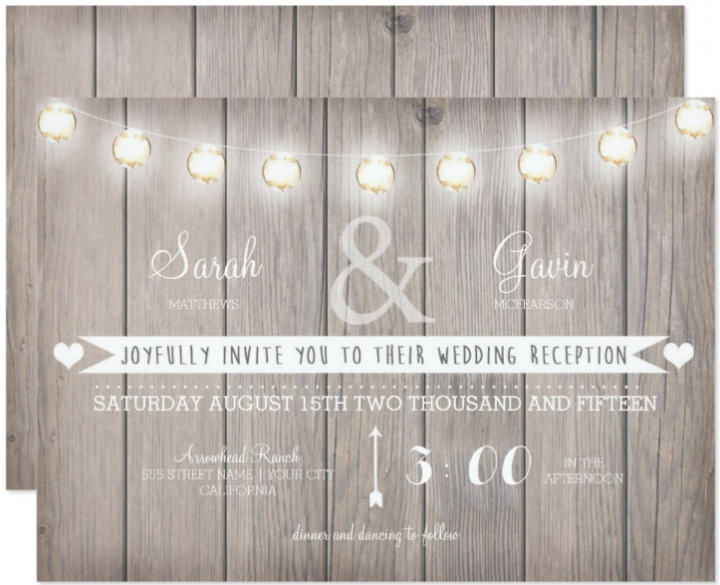 You may also see wedding invitation in PSD.